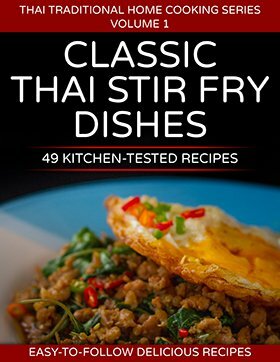 One could argue that the entire evolution of the culinary arts – across nations and territories – is built on our exploration of this essence, in wrapping and amplifying this dense mass of umami flavor; in creating layers upon layers, and inventing complex dishes with compelling flavor profiles by using dry spices, vegetables, fruits and herbs. Umami is everywhere. It is not a rare taste in nature, and it is abundant in cooked and cured meat, mushrooms, seaweed and even tomatoes. For thousands of years, preserved fish products and related condiments were used across Europe and Asia. The Romans used fermented fish innards to make their prized garum – more valuable than gold – as well as their own version of fish sauce called liquame. 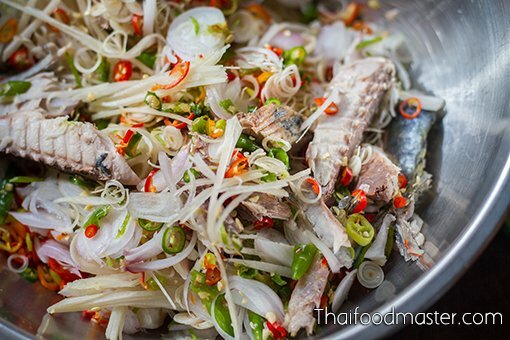 As time passed, fermented fish products have mostly disappeared from standard European cuisine, but they are still widely used in Asia. The fermentation technique is very simple; it is believed to have developed in the rice-cultivating communities of southeastern China, where the three ingredients required to produce it – namely freshwater fish, salt and rice – were found in abundance. The technique was further adapted in the coastal areas using saltwater fish and a slightly different process of simply salting and fermenting small fish, using salt alone, or salting and drying larger fish. 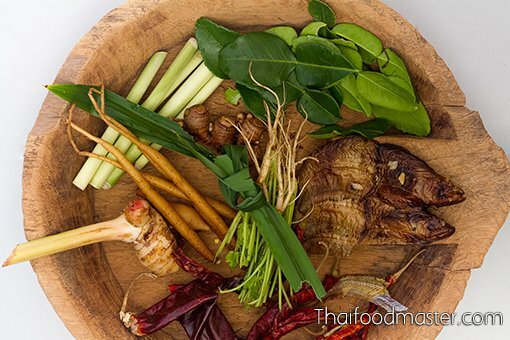 Fermented fish and its products were used primarily as dipping condiments to add desired flavor to rice and vegetables. Just a tiny amount was enough to season plain-cooked rice and, even used sparingly, helped ensure that an individual consumed enough rice and vegetables to maintain good health. 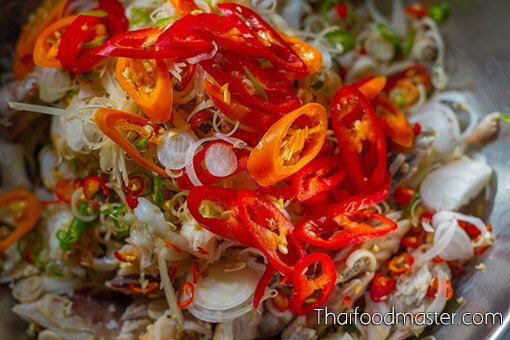 The following is a rough outline of the three main methods used to produce fermented fish products in Thailand. It is presented here as a guideline only. 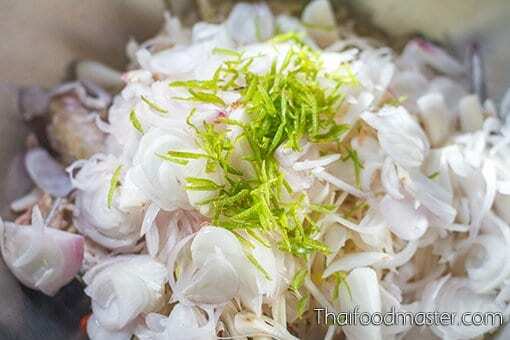 Bplaa raa ram (ปลาร้ารำ) – Fish, salt, rice husk. Bplaa raa khaao khuaa (ปลาร้าข้าวคั่ว) – Fish, salt, roasted rice powder. 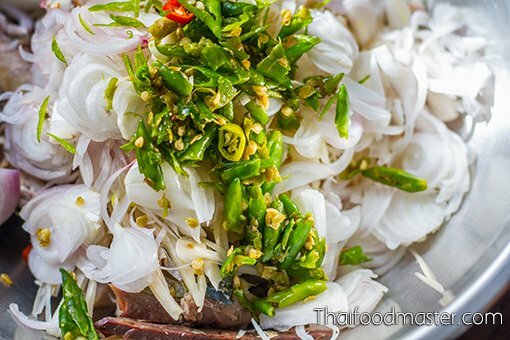 Bplaa sohm (ปลาส้ม) – Fish, salt, cooked rice. 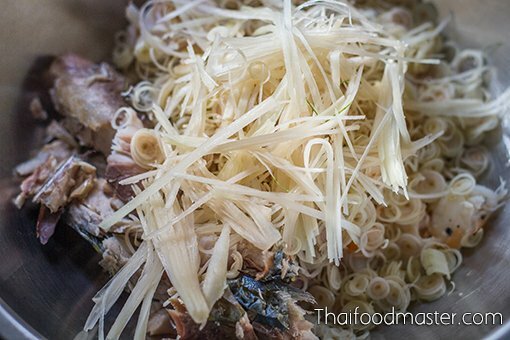 Bplaa jaawm (ปลาจ่อม) – Fish, salt, garlic, and roasted rice powder. 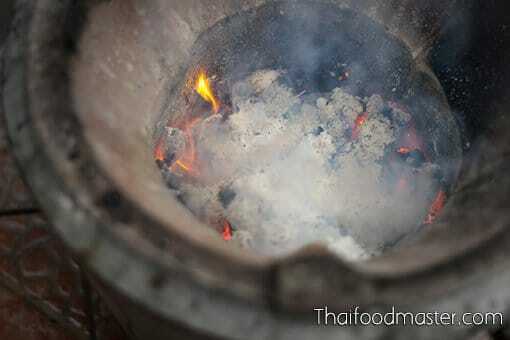 This process involves fish, salt and rice, either the rice husks, ground roasted rice or cooked rice. The rice contributes bacteria and yeasts that are responsible for starting the fermentation process together with the fish enzymes. 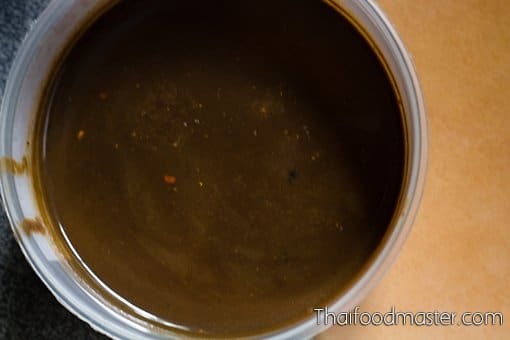 Fish sauce, nam bplaa (น้ำปลา) – Fish and salt. 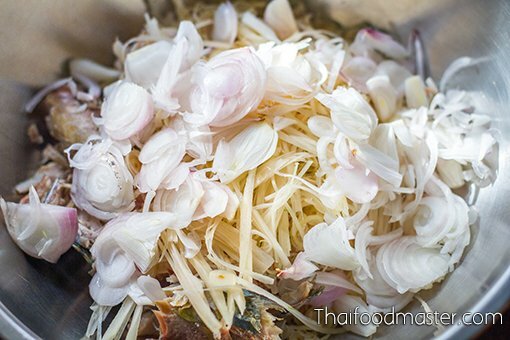 Fermented fish innards, dtai bplaa (ไตปลา) – Fish innards and salt. Fruits such as pineapple that contain strong enzymes are mostly used for fermentation in certain parts of the northeast (Issan), especially in Ubon Ratchathani Province. 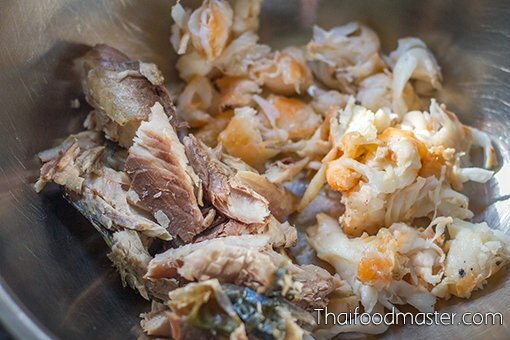 Khem bak nat or maak nat (เค็มบักนัด หมากนัด) – Fish, salt pineapple. 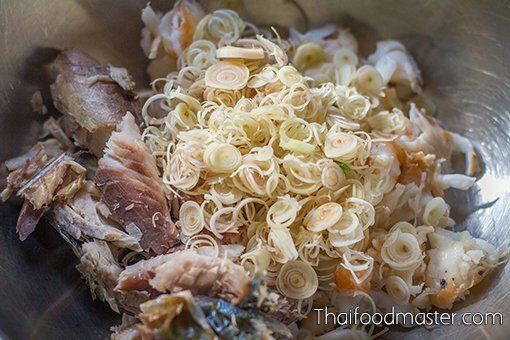 Fermented fish innards (dtai bplaa, ไตปลา or phoong bplaa, พุงปลา) are usually associated with a curry dish that is almost emblematic of the fiery hot Southern Thai food. In ancient days, however, fermented fish innards were used to prepare an extremely spicy and very tangy condiment with a sharp, pointed flavor profile, and an aggressive umami fist. 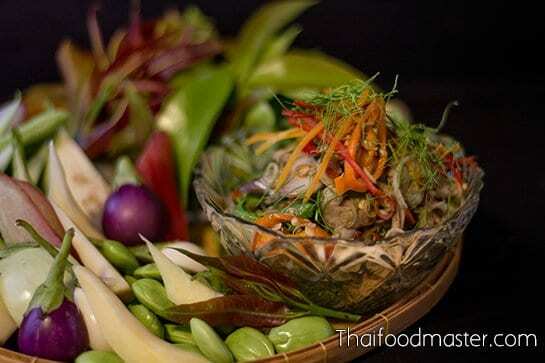 This condiment was served with rice and variety of vegetables, young leaves and herbs. 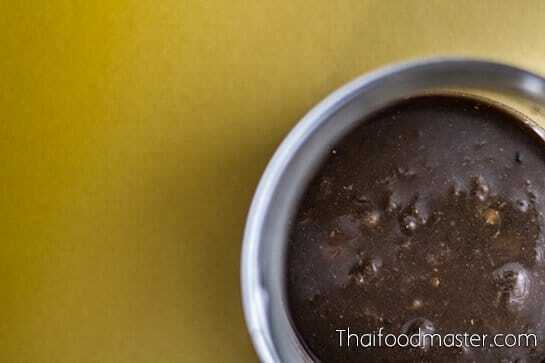 The dipping sauce made its way into the kitchens of the royal court as early as the Ayutthaya period (1351 to 1767 AD), via nobles who were stationed by central governance in peripheral and strategic settlements in the south. 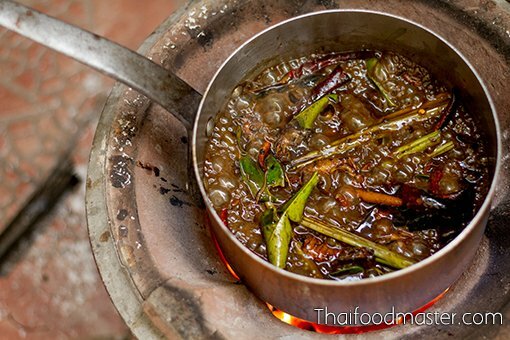 This is yet another example of a peasant food adopted for royals and nobility; other dishes include rice soaked in cold perfumed water (khaao chaae, ข้าวแช่), lon relish of fermented fish cooked in coconut cream (bplaa raa lohn nai gala, ปลาร้าหลนในกะลา), spicy fermented fish innards curry (gaaeng dtai bplaa, แกงไตปลา) and sour yellow curry (gaaeng leuuang, แกงเหลือง), among others. The royal cooks applied their considerable skill and innovation to mellowing the pungent odor of dtai pla, and bringing its intense umami personality down to a slightly more sedate level that would be acceptable, desirable and palatable to high society. 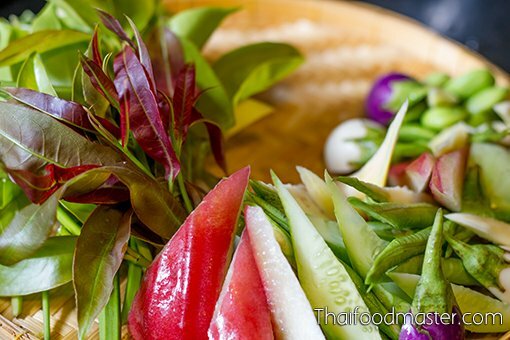 Dtai bpla sohng khreuuang (ไตปลาทรงเครื่อง) was the fruit of their creation: a salad rich in ingredients such as large and sweet grilled river prawns, and a blend of aromatics. 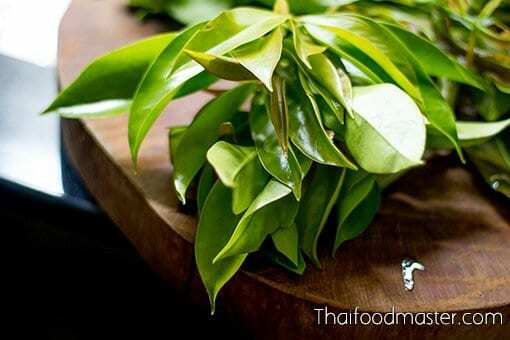 It was served, according to the southern Thai cuisine tradition, accompanied by an assortment of young leaves, vegetables and herbs commonly referred to as phak naw (ผักเหนาะ), phak jim (ผักจิ้ม) or phak glaaem (ผักแกล้ม). And for those members of the court who were unable to acquire a taste for the salad dressing, the same salad – without the fermented fish innards – was presented under the somewhat humorous name “pretending fish innards salad” (saaeng waa, แสร้งว่า or saaeng waa dtai bplaa, แสร้งว่าไตปลา). 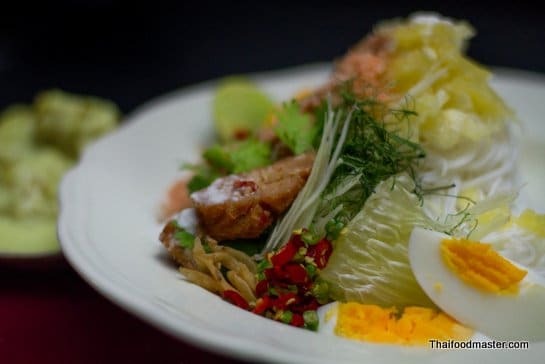 Saaeng waa salad was one of King Rama II’s assumed favorite dishes, and the king mentions it in his poetry, where he describes the incomparable dishes and arrangements at the hands of his queen. To mellow the aggressiveness of the fermented fish innards, as well as to ensure its hygiene, we cooked this with loads of aromatics. We started by expanding the umami core with an additional layer of savoriness and smokiness, char-roasting smoked dry fish and dry long chilies. 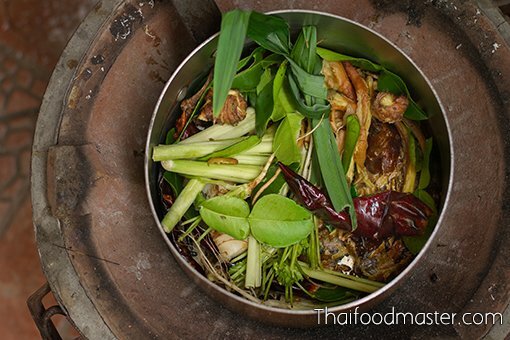 To this, we added lemongrass, kaffir lime leaves, pandan leaves, coriander roots, fingerroot (krachai) and galangal, cooking until each element released its aromas, and together helped to counter the fishy odor of the fermented fish innards. The liquids were then strained, and the intact bits of the fermented fish innards were collected. This was the base of our salad dressing. The dressing was made by seasoning this base with tamarind paste, kaffir lime juice, lime juice, palm sugar and some fish sauce, introducing a soft, aromatic citrusy fragrance and a quiet layer of sweetness that helps blend the dressing with the salad ingredients. 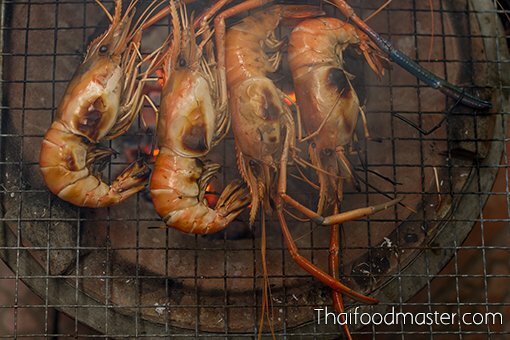 As our main ingredients we chose to use sweet large river prawns and steamed mackerel, both grilled over charcoal to which grated coconut was added to sweeten the smokiness. 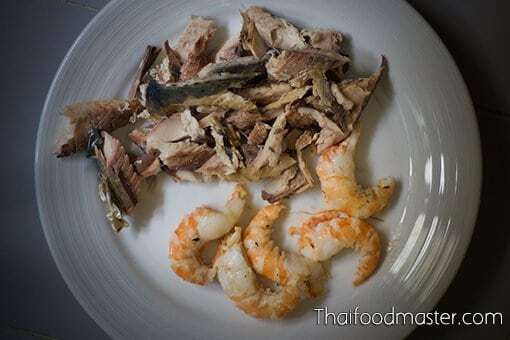 The smoked grilled prawns and mackerel meat were then combined with thinly chopped lemongrass, julienned young ginger and sliced shallots. 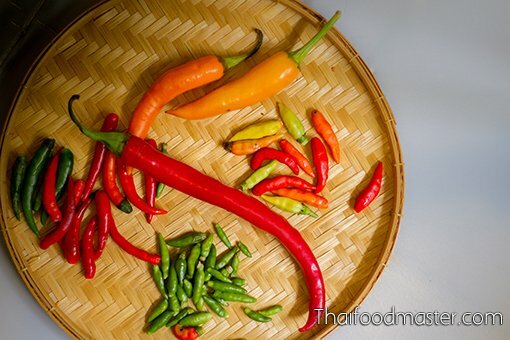 Fresh chilies, of different varieties and cut to offer varying angles of spiciness, aroma and color, were also added, as were coriander leaves, kaffir lime zest and kaffir leaves. We served it alongside fresh and crunchy small eggplants, sour young tree leaves, banana blossom, cucumber, stink beans, yardlong beans and rose apple. The resulting salad presents a thoughtful flavor layering over a savory, salty and somewhat smoky core of fermented fish innards dressing, resulting in a feast that is delicious, nutritious and healthy. Select either freshwater or saltwater fish: each fish will result in a different product, so we recommend that you experiment. 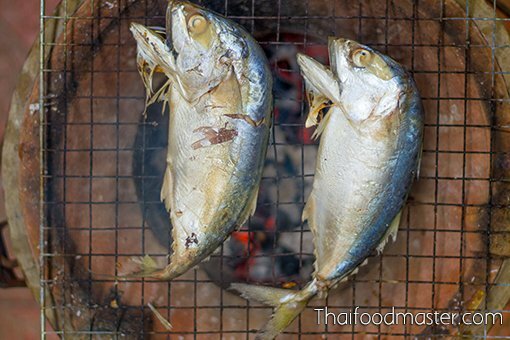 Mackerel innards are a good choice because they contain aggressive enzymes, and they are also popular in Thailand, along with snakehead fish (bplaa chaawn, ปลาช่อน), threadfin bream (bplaa saai, ปลาทราย), Indian mackerel (bplaa lang, ปลาลัง) or silver sillago (bplaa hetL kho:hn, ปลาเห็ดโคน). Using everything except the bile sacs, scrap and discard the slurry and undigested food from the intestine, leaving the swim bladder, liver, stomach, heart and gonads intact. Wash this several times in salted water, until all blood is removed and there is no fishy smell. Place the fish innards in a bowl, and sprinkle a generous amount of coarse sea salt on the top, leaving it in the sun for a few hours to boost the process. Then, place the entire batch in a glass jar, and leave it to ferment for 15-30 days. When the mixture is ready, it will separate into two layers; with the chunks at the bottom, and brown muddy fluids on top. This salad presents a thoughtful flavor layering over a savory, salty and somewhat smoky core of fermented fish innards dressing, resulting in a feast that is delicious, nutritious and healthy. Assortment of fresh vegetables such as fresh small eggplants, young Hog plum tree leaves (magaawk paa มะกอกป่า), young guttiferae tree leaves (cha muaang, ชะมวง), banana blossom, cucumber, stink beans, yardlong beans and rose apple. The raw untreated fermented fish innards in the jar. 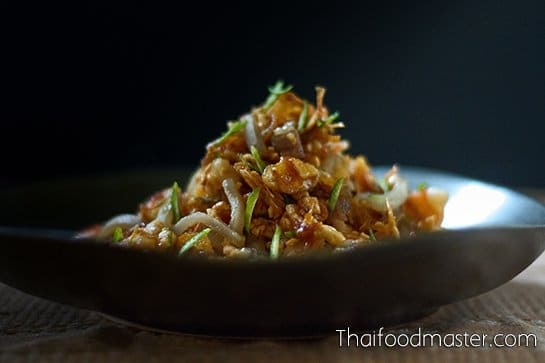 The complete set of ingredients used to prepare the base: lemongrass, kaffir lime leaves, pandan leaves, coriander roots, fingerroot (krachai), galangal, dry long chilies and smoked dry fish. 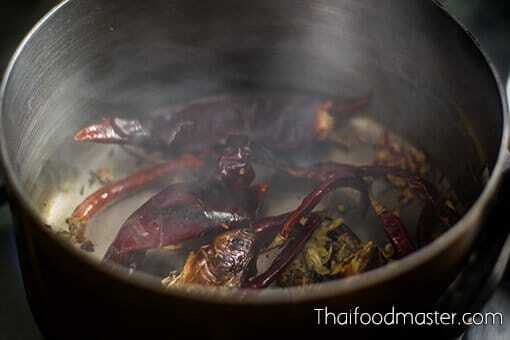 In a cooking pot, char-roast the dry long chilies and smoked dry fish (which was crumbled beforehand). Add the rest of the aromatics. Add the raw fermented fish innards and dilute with water if necessary. Boil it hard until there is no foul odor. Make sure that your kitchen is well ventilated or do it outdoors. 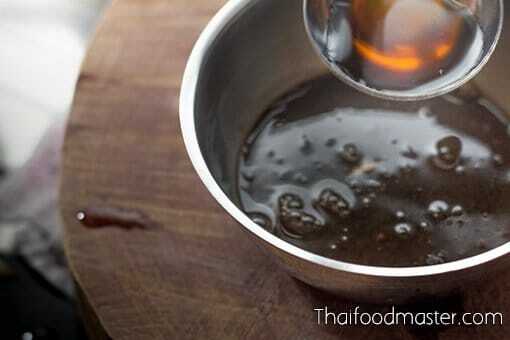 Strain the liquids, and collect from the mixture any remaining solid chunks of fish innards. Let the mixture cool, and keep it in the fridge for future use. Place about six tablespoons of the base in a mixing bowl. 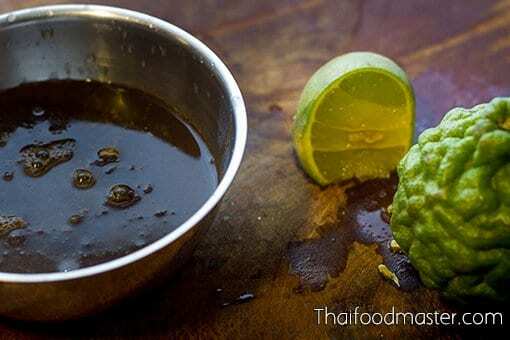 Add tamarind paste, squeeze the juice of the lime and kaffir lime, adjusting to your taste. Set up a charcoal grill. Toss grated coconut over the hot charcoals. Grill the unpeeled river prawns. 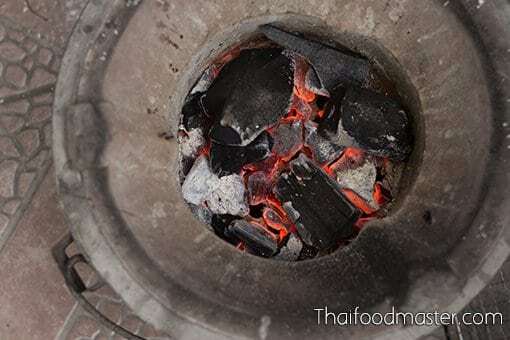 Grill the steamed mackerel until it becomes slightly golden, adding grated coconut to the charcoals as needed to maintain a good flow of smoke. 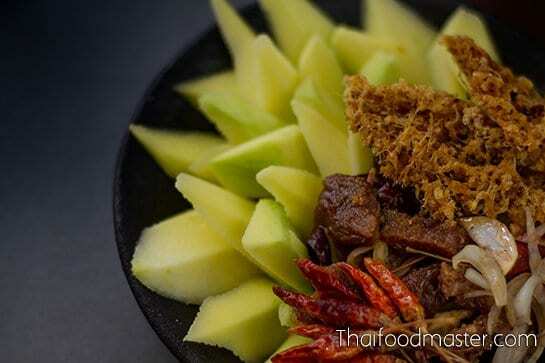 Peel the prawns and crumble the mackerel meat into large chunks, removing the skin and bones. This is our selection of fresh chili: Yellow chilies, long red chili, two types of bird’s eye chilies and Karen chilies. You can use any combination you prefer, or what is available. 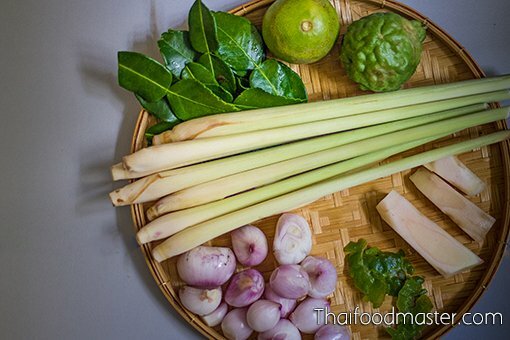 This is the set of aromatics that will go into the salad: shallots, lemongrass, young ginger, kaffir lime leaves, kaffir lime and lime. In a mixing bowl, place the mackerel meat and the river prawns, roughly cut into large chunks. Add bird’s eye chilies bruised in a pestle and mortar. Add a second type of bird’s eye chilies, along with Karen chilies, both thinly sliced. Mix everything with a light touch, being careful not to break the fish chunks. Add thick-sliced yellow chilies and red long chilies. 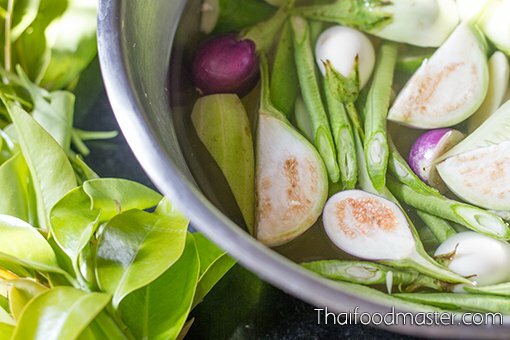 Prepare the side vegetables, soaking in cold water to let them rest and stay fresh and crunchy until serving. Pick the young leaves of the Hog plum tree. 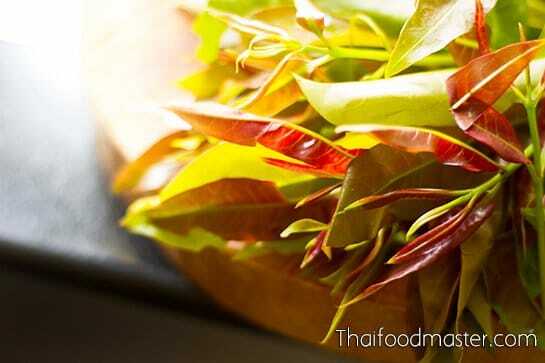 Pick the young leaves of the Guttiferae tree (cha muaang, ชะมวง). 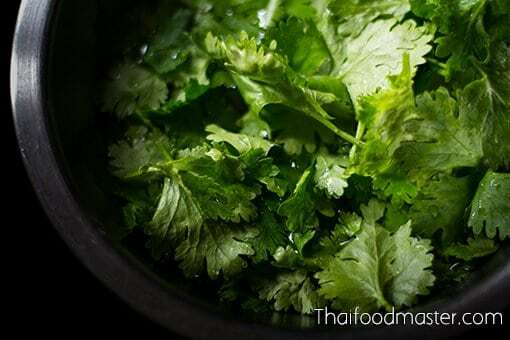 Pick the coriander leaves, and soak in cold water. Arrange the side vegetables on a serving plate. 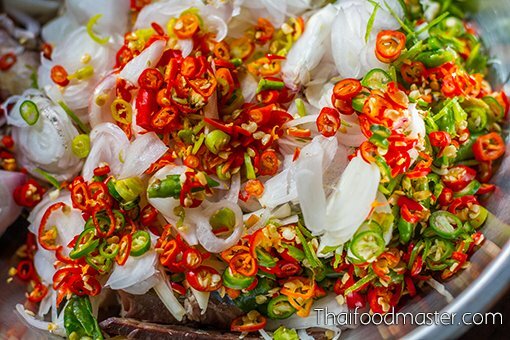 Season the salad with the dressing, place it in a serving dish, and sprinkle with coriander leaves, juliennes of kaffir lime leaves and garnish with juliennes of red and yellow chili peppers. Serve with the fresh vegetables and leaves. 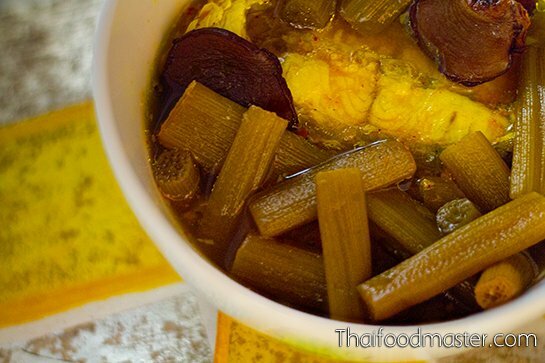 Yellow sour curry (gaaeng leuuang, แกงเหลือง) is considered a comfort food for the people of Thailand’s southern region. Lavish amounts of fresh turmeric give this spicy, sour and salty curry its rich yellow tint, as well as its earthy aroma and a pleasantly bitter taste. 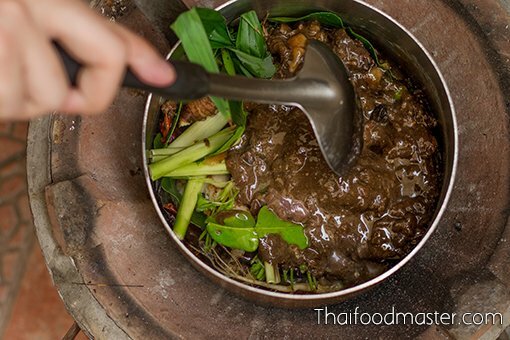 The curry also contains generous portions of the southern dark fermented shrimp paste, resulting in a cloudy, ochre-colored dish. 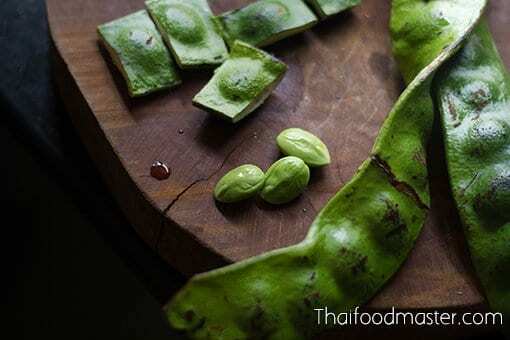 Southern yellow sour curry is primarily made with saltwater fish, and with either water spinach (phak boong ผักบุ้ง), bamboo shoots (fresh or pickled), green papaya, the stems of the giant elephant ear plant (Colocasia gigantea) (aaw dip อ้อดิบ or thuun ทูน), winter melon (fak khiaao ฟักเขียว) or lotus stems. 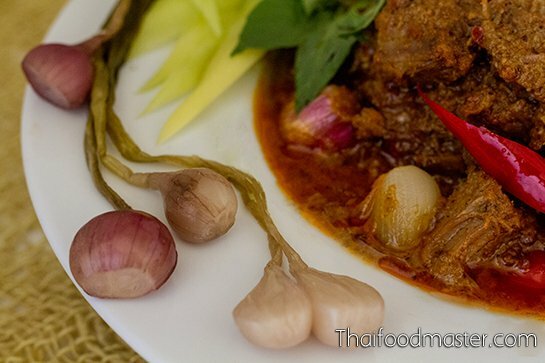 But versions of the curry that include freshwater fish, shrimp, salted threadfin fish (bplaa goo lao khem ปลากุเลาเค็ม), or even beef or pork belly, are not rare. 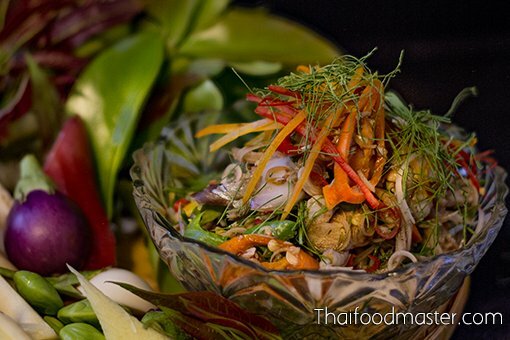 This salad recipe is adapted from the book “Maae Khruaa Huaa Bpaa” (แม่ครัวหัวป่าก์), published in 1971 as a memorial for Jao Jaawm Phit (เจ้าจอมพิศว์). Jao Jaawm Phit was the daughter of Thanpuying (Lady) Plean Passakornrawong, who was a pioneer of noble Thai cuisine. I love your insight into the origins of umami flavors. Your website is wonderful. Never used fish innards. Crab and shrimp miso are very tasty though. I love shrimp that comes with eggs. Great to make into soups.